Mix all of the marinade ingredients together and place in a non-metallic bowl. For the black cod, add the fish to the marinade, cover with cling film and place in the fridge preferably overnight or a minimum of two hours. Preheat the oven to 180C/350F/Gas 4 (160C fan). Lightly oil a non-stick baking tray. Place the fish, skin-side down onto the baking tray. Spoon over two tablespoons of the marinade and then bake for 10-12 minutes, depending on the thickness of fish. Preheat the grill. Remove the fish from the oven, place the remaining marinade over the fish, place under the grill and cook until golden-brown. For the Chinese greens with sesame sauce, heat a small non-stick frying pan and dry-fry the sesame seeds until just lightly golden-brown. Put into a pestle and mortar. Grind to nearly a paste, but still with some texture. Add the sugar, soy sauce, dashi, and citrus juice. Give a good grind to incorporate all the flavours. Add a couple of sprinkles of Japanese sansho pepper. Rinse the greens well, trim the base of the stems and cut the rest into bite-sized pieces. Place a steamer on top of a pan of boiling water. Steam the broccoli for 1-2 minutes, or until tender. Transfer to a suitable serving dish and spoon over the sauce. 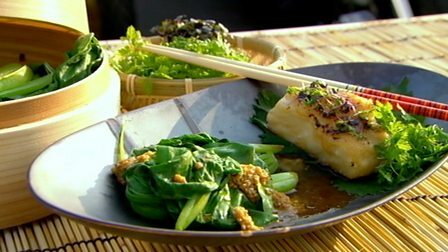 Serve the fish with the Chinese greens and with lime wedges and micro salad on the side.